I think most people know how highly I think of the work that the AdoptionDNA Community is doing. They are a proactive group of incredibly intelligent and talented individuals who have banded together with a common cause - to give hope to all adoptees searching for their heritage. I am proud to say that I often collaborate with members of their community and can count a handful of them among my closest colleagues. Fortunately, for the rest of us non-adoptees, their innovative work is starting to benefit us all. The methodology that they have created for their adoption cases has recently resulted in many success stories and can be applied to most any relatively recent genealogical brick wall. They have created ways to streamline the work of autosomal DNA matching and analysis and are now offering to share this with the rest of the genetic genealogy community. The new website DNAGedcom delivers some of the tools that are most often requested from the major DNA genealogy companies. In this first phase of development, developer Rob Warthen has recently enabled access for all users to the FTDNA Family Finder and 23andMe downloads (though he cautions users that, at this early stage, there may still be bugs to work out). Through DNAGedcom it is now possible to download a full list of your matches, including the matching segment data from both companies. Those of us who have worked extensively with autosomal DNA for genealogy, know what a huge time saver this is. For me, with over 1000 shares on my main account at 23andMe, it has saved me tens if not hundreds of hours. Users are required to register to use the site, but it is a quick and easy process. For 23andMe, this means that instead of downloading the matching segments for Family Inheritance Advanced three at a time, it is now possible to download a file with all the matching segment data for each of your matches that you are sharing genomes with all at once. If you have a single profile on your account, the Ancestry Finder matching files will also be downloaded. I usually integrate the public matches from the Ancestry Finder file with the Family Inheritance Advanced data to create a master spreadsheet of all available matching segments for each of the profiles I manage. There is even a place to store your spreadsheets (.csv files up to 200 KB)! This website is still in the early development stages, but intends to continue to deliver the most often requested tools to the genetic genealogy community. In fact, there is already a full featured phase two version of the site with even more highly desirable capabilities in development. (Rob tells me that improving AncestryDNA's functionality is next on the list!) The site is currently run solely on donations and affiliate income. The website agreement can be found here and is linked to directly from the home page. Any problems with the site should be directed to support@dnagedcom.com. Those of you familiar with adoption search, may recognize the names of some of our top search angels there. Their experience and expertise, combined with that of our very talented technology experts has made for a powerful team. 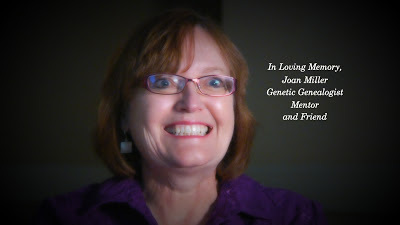 I am extremely saddened today to learn of the passing of my dear friend and fellow genetic genealogist and blogger, Joan Miller. Joan passed away on Friday after a very brave battle with a long illness, throughout which she always stayed positive and full of hope. She was just that kind of person. When I first started blogging, Joan was extremely encouraging and generous. At the SCGS Genealogy Jamboree 2011, she encouraged me to attend the GeneaBloggers' Ice Cream Social. While there, she lovingly walked me around the room and introduced me to every person there. I was deeply impressed by her kindness that night and continued to be so throughout our friendship. The timing of her death meaningfully coincides with the announcement of the SCGS/ISOGG "DNA and Genetic Genealogy Conference" to be held in conjunction with SCGS Jamboree. This is very significant to me since my dream of this conference was born from Joan's vision. At the 2011 SCGS Jamboree we discussed her idea to approach the organizers of the event to host a genetic genealogy pre-conference. She never got the chance to do so, but when they came to me with the same idea, I immediately thought of Joan. It is a reality now and I know that she would be so proud. My participation in this conference will be in her honor and we will be memorializing her contributions at the event. 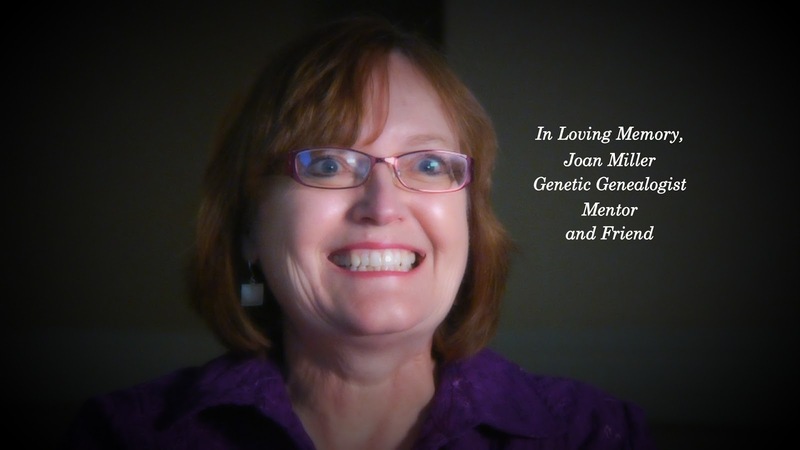 Due to the distance between our homes, our friendship was mostly "virtual", but I had the pleasure of interviewing Joan at the 2011 Family Tree DNA Administrator's Conference. She spoke about her love of genetic genealogy with passion and intelligence (just like she did everything). She was such a joy. 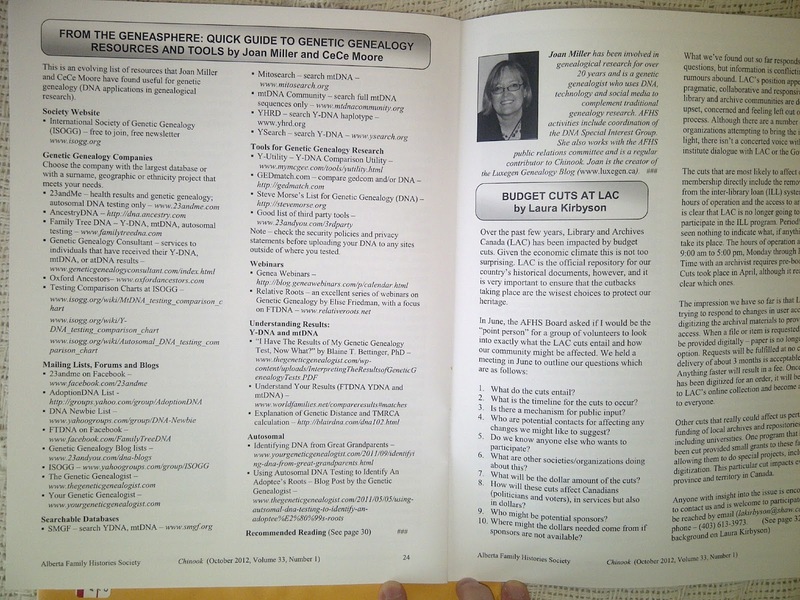 Joan was a prolific and award winning blogger at the Luxegen Genealogy Blog. One of her favorite subjects to write about was genetic genealogy and we owe her gratitude for introducing many of her readers to DNA testing for genealogy. As a retired manager of a medical research lab and a self-described "science geek", Joan was uniquely positioned to understand the complexities of DNA testing and, as a natural teacher, translate that knowledge into easy-to-understand language for her readers. She also coordinated the Alberta Family History Society DNA Interest Group where she was an active volunteer. They were very lucky to have her there to mentor the participants in person. As a long-time genealogist, she was an early adopter of using the Internet to connect with other genealogy researchers. According to an interview at GeniMates.com, she set up her first genealogy webpage in 2001. She was well known as an active and beloved member of GeneaBloggers and the online genealogy community as a whole. As such, I'm sure that my memorial post will not be the only one. 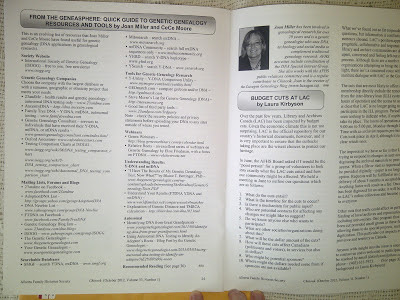 For the recent Fall 2012 Issue of the AFHS Chinook Journal, Joan and I co-authored a Genetic Genealogy Reference Guide. She did most of the work on it, but generously insisted that I receive credit for the updates that I made to her list since she had been away "From the GeneaSphere" (the name of her regular column in the journal) due to her illness. She also asked me to look after her small, but beloved Aumack DNA Project while she was healing. I guess that was a more permanent request than I had hoped. Joan had first started working with DNA for genealogy in 2005 when she asked her brother to test so she could join the Kerr/Carr DNA Project (Kerr = her maiden name). She speaks about that experience and what she learned in our video interview above. Joan and I shared regular, albeit brief, correspondence since she learned of her illness about a year ago. In our last exchange, she was her typically encouraging and positive self and more interested in my well-being than hers. Always thinking of others, she enthusiastically shared an idea she had for me - to create a DNA ebook for beginners. I should listen to her advice. A retired manager of a med research lab, Joan Miller is a genetic genealogist with an interest in social media and technology to complement traditional genealogy research. Her genetic genealogy activities include Aumack Y-DNA project administrator and coordination of the Alberta Family Histories Society (AFHS) DNA Special Interest Group. Joan has been involved in genealogical research for over 20 years and she tries hard not to bore the rest of the family with her hobby (addiction?). Several family members do read her blog and they all love the family tree banners she creates and the stories she collects. She is a member of the Genealogical Speaker’s Guild, and various genealogy societies. This busy genealogist writes a regular column entitled “From the Geneasphere” for “Chinook”, a publication of the Alberta Family History Society and serves on the Public Relations committee of that Society. Joan is the creator of the Luxegen Genealogy Blog which was named in Family Tree Magazine’s Top 40 Genealogy Blogs for 2011. She served as an Official Blogger for Rootstech 2011 and is delighted to be continuing in that role in 2012. Joan, who lives with her husband and their daughter’s cat in Calgary, Alberta, Canada enjoys varied activities. She volunteers with Toastmasters International, plays indoor soccer, relishes outdoor pursuits, and travels widely. She has admitted that she is a “Genealogy Conference Junkie”. Turn off the news. Get off twitter. Go spend some time with the people you love instead. Much better use of time. Peace out. I think I will go do that now, but I will be thinking of Joan who I loved very much. We all did. She was one of the most generous, kindest souls I have ever know. I will never forget her. Jan 4, 2012 - The International Society of Genetic Genealogy and the Southern California Genealogical Society announce an innovative, important one-day DNA conference, “Family History and DNA: Genetic Genealogy in 2013,” to be held June 6, 2013, in conjunction with the Southern California Genealogy Jamboree. The featured speaker is Dr. Spencer Wells of the National Geographic Genographic Project, who will review the Genographic Project 2.0. Other speakers presenting state-of-the-art uses of DNA in the search for ancestors include The Genetic Genealogist Blaine Bettinger; Dr. Tim Janzen; The Legal Genealogist Judy G. Russell; Your Genetic Genealogist CeCe Moore; DNA Testing Adviser Richard Hill; and Katherine Borges, the director of ISOGG. Also participating in the day-long seminar will be representatives from the major commercial DNA organizations – Family Tree DNA, 23andMe and AncestryDNA. Separate tracks will be targeted for beginners and advanced genetic genealogists. One-on-one consultations will be available during the final hour of the day. Help is available to interpret results and to use the various testing organization websites and resources. This personal assistance will help even the most inexperienced family historians apply genetic genealogy as another tool in their research toolbox. Online registration for “Family History and DNA: Genetic Genealogy in 2013” and the Southern California Genealogy Jamboree opens on Friday, January 4, 2013. Early-bird discounted registration is $175 for SCGS members and $195 for nonmembers. Prices increase after 30 April 2013.The conference will be held at the Los Angeles Marriott Burbank Airport, 2500 Hollywood Way, Burbank, CA. The Southern California Genealogy Jamboree will also be held at the Burbank Marriott on June 7-9, 2013. It is produced bu the Southern California Genealogical Society, 417 Irving Drive, Burbank, CA 91504, phone 818-843-7247. Further information can be found at www.scgsgenealogy.com and http://genealogyjamboree.blogspot.com. I will also be keeping everyone updated here at "Your Genetic Genealogist".